These days, we always think of a black hooded cloak as some kind of evil intent, like cowboys wearing black hats. It's actually pretty rude to stereotype all black cloak wearers as evil. Hooded cloaks are vital for a lot of important good stuff too! Like what? Well, when you're a Jedi knight, you need to maintain an air of mystery. How do you do it? With a non-hooded cloak? Don't be silly! And if you're the quiet tracker sitting in the corner of the bar, waiting to find rumor of the monster you're hunting, you can't have everyone looking at you suspiciously. Better to hide that face! 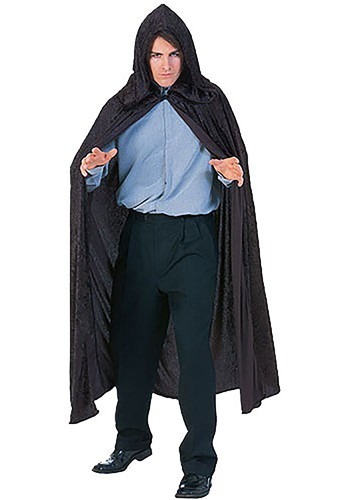 And of course, if you are up to no good, the cloak is perfect for masking your intent and your face. Basically, we're starting to wonder why everyone doesn't wear a black velvet hooded cloak. Keeps you warm, keeps your face hidden, protects you from too much sun? We should change the name to All Purpose Hooded Cloak. You ought to grab one now before everyone is sporting these! Be the first on your street to own one... although no one will know it's you because of the whole hooded cloak thing. Which is the whole point!